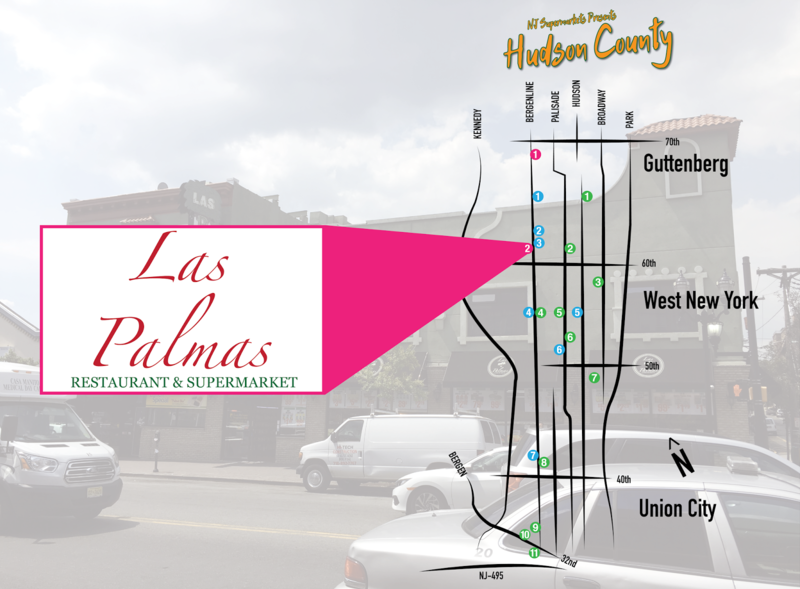 Heading diagonally across the street from the old Fine Fare we saw on Friday, we find Las Palmas, a combination supermarket-casual restaurant-upscale restaurant. And yes, it's literally across the street. 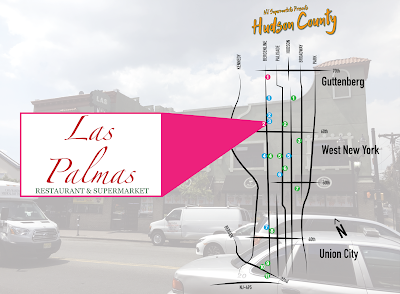 The Fine Fare was on the northeastern corner of Bergenline and 62nd, and Las Palmas is on the southwest corner of the same intersection. The supermarket had previously been operating under the name Super Grande Supermarket, or literally "Super Big". Hmm, I think Las Palmas is a more tasteful name. The restaurant/nightclub is famous for its Cuban food and gets pretty good reviews on Yelp. Approaching the supermarket/restaurant from the south, on the east side of Bergenline Ave. We're looking up towards the Met Foods and Fine Fare up here. The view from across the street. The building is quite nice and has been repainted recently when the switch from Super Grande to Las Palmas occurred. In fact, it had me expecting a more upscale experience in the supermarket that what it actually is. I think it's more in line with the restaurant. The entrance to the store is just about under the vertical sign, and the entrance to the restaurant is past that. I have to give Las Palmas credit for at least one thing, and that is how they display the produce prices. Notice how produce lines the front wall, and the price signs are above the produce, double-sided so people can see the produce prices without even going into the store! The entrance to the supermarket is at the back of the gray SUV, and the restaurant entrance is just out of the frame above. You enter and turn right to go down the produce aisle. The aisles run parallel to Bergenline, with checkouts along the left side. There is another entrance in the rear, which leads directly to a municipal parking garage (gee, I wonder if that was an accident). Some new shelving and some older. This store is a Krasdale affiliate and has service meat and deli. Strangely enough, it does not use a circular of any kind. Some pretty old freezer and dairy cases. The flooring is interesting, and I'd like to know if it was installed recently and intended to make the store a little higher-end (which it's not). I kind of like it, but it's a little noisy for carts. Reminds me of what Fairway has in some of its stores. I was not wowed with Las Palmas Supermarket, but it's a solid grocery store. I'd like to come back and try the restaurant sometime -- which is of course only one of many great restaurants on this corridor. Over and out for this week, and we'll be back with a store tour on Monday!